With 2013 marking the 40th anniversary of the iconic Nike Blazer, NSW will be releasing a variety of premium looks for the classic including this snakeskin pair unveiled today. The Blazer High will return in traditional form for the celebration, sporting a bit of snakekin to bring them to life. A premium white leather builds the upper, working together with the snakeskin Swoosh and suede toecap. Green hits the classic tongue branding and heel badge, while a vintage-finished vulcanized sole sits below. 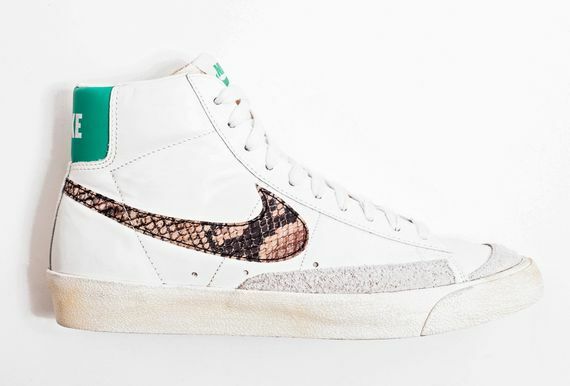 The "Snakeskin" Nike Blazer High is expected to hit select Nike Sportswear accounts next year.